Don't let late penalties catch you by surprise! Don’t let them catch you by surprise! If you were eligible for Part A for two years but didn’t sign up, you’ll have to pay the higher premium for 4 years. For Part D, the late enrollment penalty is an amount added to your Medicare Part D premium. You may owe a late enrollment penalty if at any time after your initial enrollment there’s a period of 63 or more days in a row when you don’t have Part D or other creditable prescription drug coverage. The cost of the late enrollment penalty depends on how long you didn’t have creditable prescription drug coverage. The formula used to calculate the penalty is based on the “national base beneficiary premium” which may increase every year, which means your penalty would also increase each year. This may impact your monthly premium for as long as you have a Medicare drug plan. There is a seven month period when you can sign up for Part A and/or Part B. It starts three months before your 65th birthday month and ends three months after your 65th birthday month. Let’s say you are turning 65 on May 15: You would enroll anytime during February, March or April in order to have coverage May 1 with no late penalties. While your enrollment period allows you to sign up anytime during May, June July or August, the start date for your Medicare coverage will be delayed, so be sure to sign up before the month of your birthday! 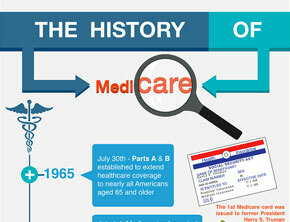 Sign up for Medicare when you are first eligible. Don’t let indecision stop or delay you. If you are unsure which plan is right for you, or if you have questions about a Medicare Supplement plan, Medicare Advantage Plan or Part D prescription drug plan, call a SeniorQuote Licensed Agent today. We can help you navigate through the complexity of health insurance, explore all your options, and get you the coverage you need at a price you can afford. With SeniorQuote you have the Power to Choose and Freedom to Save.